Last week I was at the bookstore, just browsing & I came across this Book called “Fresh Moroccan” by Nada Saleh. I immediately got drawn to the beautiful picture of a heap of Saffron on the cover of the book. I started looking through it, & my heart refused to come back home without the book. So I listened to my heart & bought it home…Having cooked Moroccan food before, I knew I was not going regret buying this. It is a wonderful book – full of colors of the food & culture, with equally colorful, healthy & easy to cook recipes. Talking of colors… I have never seen a Potato salad look so good. It tastes wonderful…with some hint of spice & exotic flavors of saffron its a truly elegant & luxurious salad. I have tried a few recipes from the book, & they have delighted our palates. Here I have made very slight changes to the original recipe. The author with her expertise as a nutritionist, claims that this dish is rich in phosphorus, potassium, Vit C, & Chromium which maintains the sugar levels in the bloodstream. 3 large Potatoes Scrubbed Clean & Peeled. Heat 1/2 Tablespoon oil in a pan until just warm. Add the Cumin Seeds, Onion & minced Garlic. Stir them for a couple of minutes. Add the Tomato paste, ginger, salt, paprika, saffron, & water & simmer them for about 8-10 minutes. 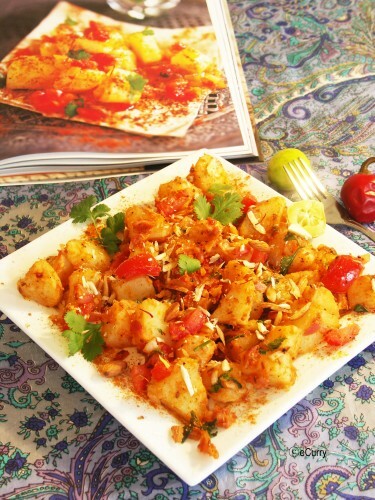 Add the Cubed Potatoes, Chopped Tomatoes, Parsely, & Cilantro/Coriander leaves & shake the pan to mix. Add the remaining oil, Black Pepper, & Simmer for another couple of minutes. Add Lemon Juice. Give it another good shake, & Sprinkle the Cayenne Pepper. Garnish with more Cilantro/Coriander Leaves & Almonds. The very first appeal of this salad even before you taste is its color. Then the taste will transport you to another flavorful exotic world. Sending this to No Croutons Required hosted by Holler at Tinned Tomatoes. This month’s challenge is Potatoes. February 14th, 2009 | Category: Salad, Salads & Soups, Sides & etc. it looks so colourful and makes me want to gobble it all up! 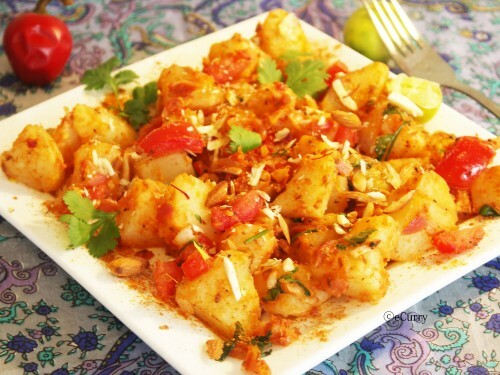 What an exotic touch for the potato with saffron and so many spices. Looks gorgeous the plate. wow soma…that looks like the exact replica of the recipe in the book..great job!! Wow yummy, spicy and herby……Makes me drool…. That potato salad looks good! I am mesmerised just looking at it. No wonder your heart pestered you to buy it. Do the potatoes have to be cooked ahead of time? The Potatoes needs to be boiled before … the seasoning takes only a few minutes. Wow, this looks so fresh & colourful. Plus, I love saffron – one of the best pasta dishes I’ve ever eaten was roasted vegetables in creamy saffron sauce, I really want to recreate it one day! Never made any dish adding saffron to potato !! wonderful idea….this one is a must try for me. U should try it. It was awesome.. This looks truly impressive! I love your photo, too. hey, why don’t you submit it for No Croutons Required event? This month’s theme is potato. Oh my, that is one good looking potato salad, the best I’ve ever seen I am sure! Love Moroccan food! Thanks Sig! We love moroccan too! Thats one colourful potato salad! Looks absolutely delicious! This looks and sounds so flavorful….and why only salad,i can hell eat it like subzi with roti(or more sinful…with poori) and i dont think anything could stop me at using this in sandwiches minus the almonds and olive oil…wht say dear? Gorgeous pucs Soma..now who can resist that salad! I like the looks of this potato salad. It’s color gives it some real pop, and I bet it’s super tasty as well! I think this is the best potato salade i have ever seen in my whole life. Looks so beautiful and so so delicious. Its the first time i have ever seen potato salad in this manner…..looks gorgeous.First time to ur blog…u have a wonderful blog out here. 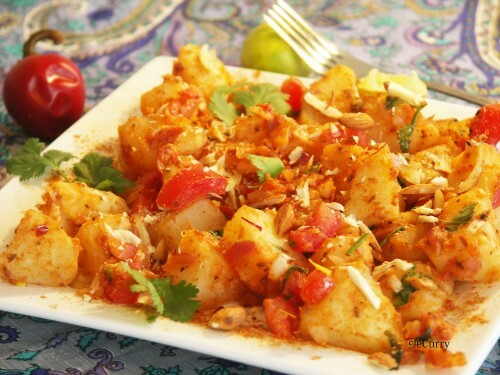 I love this version of potato salad with almonds and saffron and all the spices – how delicious! Looks exactly like the pic, so colorful. Is there a good soup there ? Soma, this sounds delicious…love the exotic spices. There’s beneficial info here. I did a search around the topic and discovered most individuals will agree with your blog. Keep up the very good do the job mate! Hey, As a Newbie, I’m constantly searching on the internet aol for posts which will assist me. Thank you. Easter Eggs, Easter Eggs and More Easter Eggs, Oh My! - My Life, Blogged.